Don’t get me wrong, I love Christmas, but the run up is a long one. We had nursery and school fayres in mid-November, and the shops have been Christmassy since the start of October. I think we’re in danger of losing some of the magic. However, there’re certain things that we do that are simple, which the kids really enjoy and that don’t break the bank. We are starting to get a collection. My eldest daughter Sofia was bought a big felt one that you hang on the wall and has 24 little pockets to stuff treats into. It’s already a tradition, and it’s an exciting thing when it comes out of the loft. Then came the Victorian Townhouse 3D calendar, which I got from a friend who was a Phoenix Trading representative. Fantastically, they have three in the range now, so each year, for the past couple of years, I’ve got the Townhouse, Department Store and Bakery for the three girls. Amazingly we haven’t had arguments about who has which! 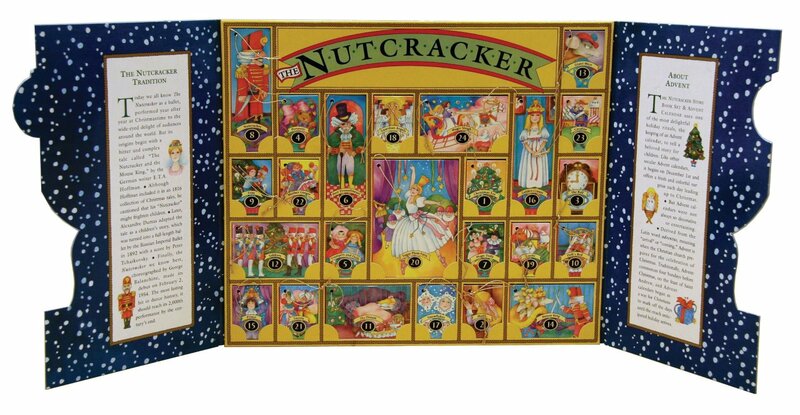 Then this year came the birthday present keepsake for Sofia from The Bristol Parent: The Nutcracker storybook set and advent calendar. It is truly beautiful. There are 24 little books, which retell the complete story. Even better, they have little cords attached so you can hang them on the tree. This will be coming out year after year, and I’m hoping that it’s something she can eventually pass on. 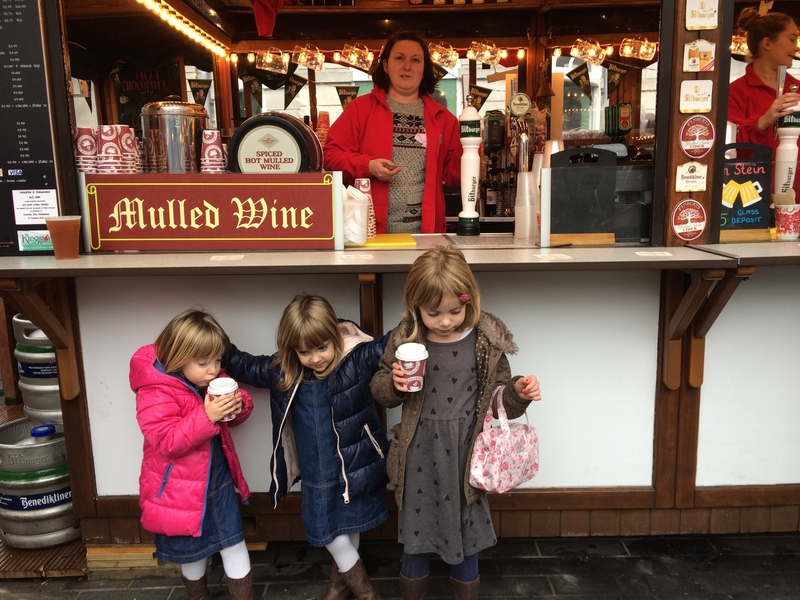 We already had Santa is Coming to London, and as a Londoner I loved it. However, we now live in Surrey. So when out on my one and only (quite short, due to school run) Christmas shop, I was very excited to see the Santa is Coming to Surrey hardback for the bargain price of £4.99. 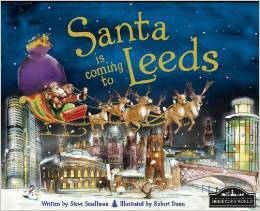 Reading about local landmarks with a Christmas theme equals much excitement!! Sofia was bought the wonderful Usborne book Christmas Decorations to Cut, Fold & Stick as a birthday present. She absolutely adores it. She has just turned six and was able to do it completely independently. I will be buying another one next year! Paper Chains The twins’ nursery fayre was a bit short on Christmas decs, so we got going on making paper chains with random coloured strips of old wrapping paper and drawing paper that we had in the art box. 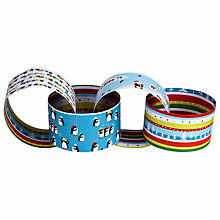 They loved doing it so much I bought a great festive paper chain kit from John Lewis. 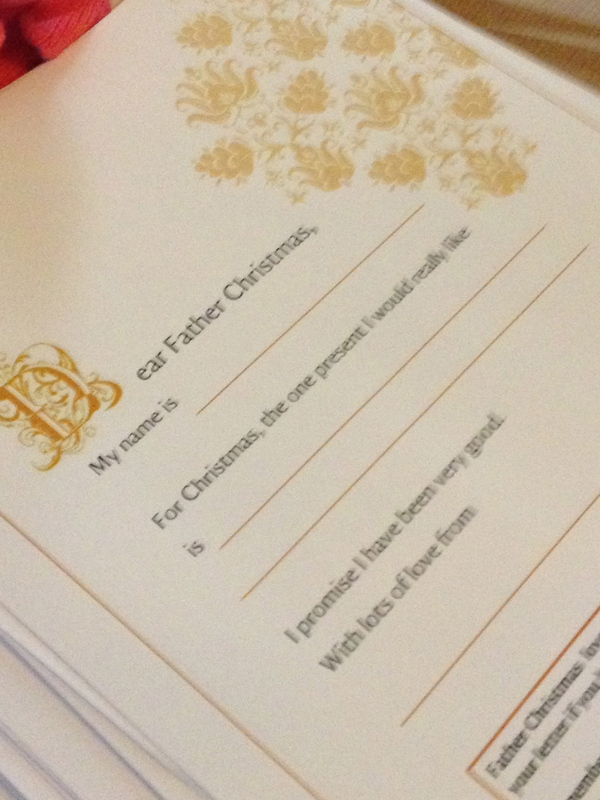 Lovely quality, thick paper; dotted lines to show where to cut and little sticky dots to hold the links together. It also includes a penguin design. Ahh Monty. Paper plate angels – A cute activity that the girls really enjoyed doing. 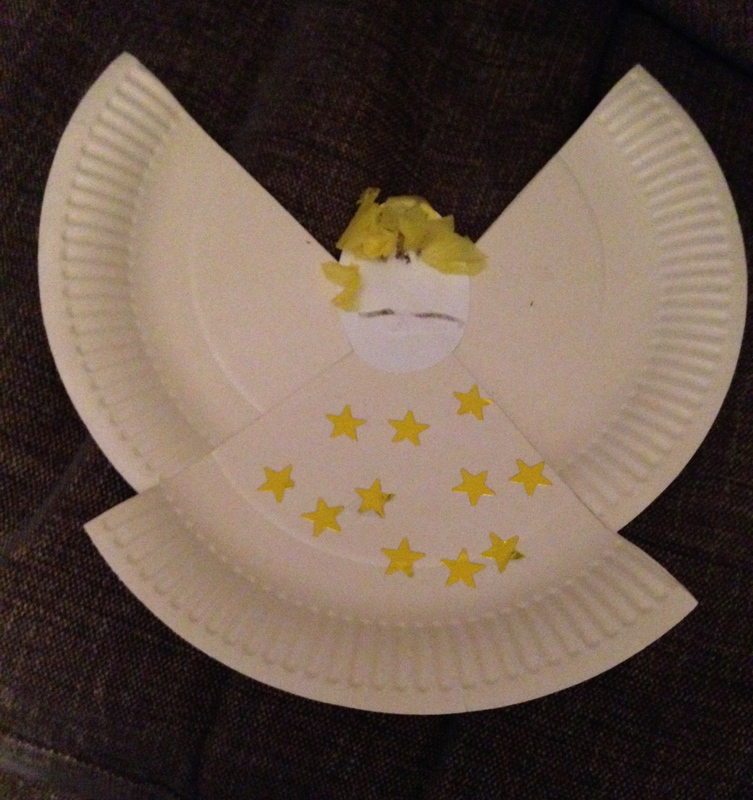 There are quite a few variations on the ‘paper plate’ angel. This is probably the simplest. Take one white paper plate, cut out a V-shaped section, which is just under a quarter of the plate and attach at the bottom. Then decorate. Glitter pine cones – This has to be one of the easiest (and cheapest) craft activities ever. Forage for a few pinecones, daub with PVA glue and dunk in glitter. Then simply attach a sparkly pipe cleaner or ribbon and voila a Christmas tree decoration. Remembrance bauble – Sofia goes to an after school club that’s run by one of our local churches. The other week we were asked to email over a picture of someone that our family would like to remember. A week later the children (with some help I’m guessing) had made them into a bauble. These are now adorning one of the trees that they’ve put up in the church. I thought that it was a really lovely idea. Your child could also draw a nice picture to go in there. A quick Google has thrown up a pack of four create your own baubles for £9.99, but eBay has quite a few options also. 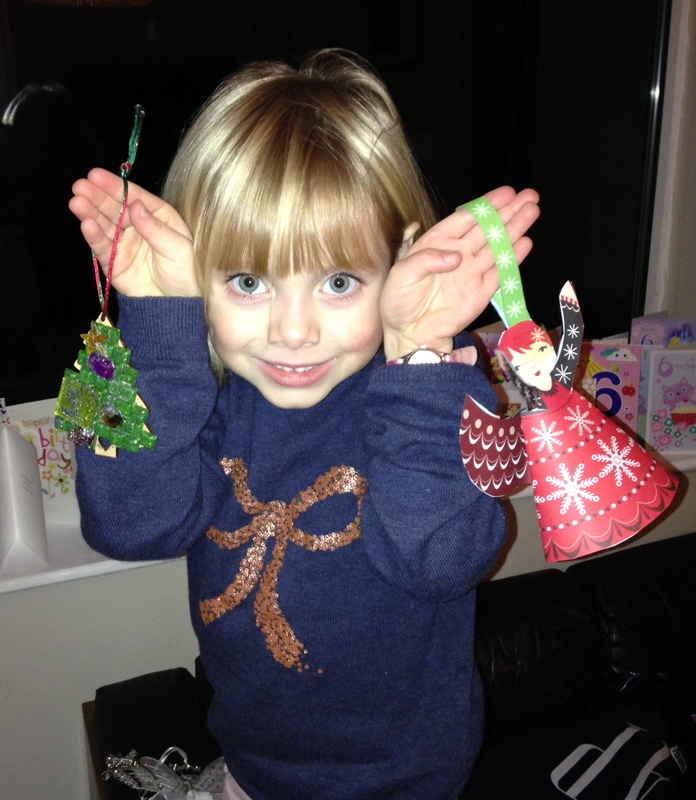 More tree decs – we visited a Christmas fayre and there was a nice DIY craft stand. For £2.50, we got plain flat wooden decorations that the kids could customise with glitter and all manner of gems and sparkles. Sofia (seen here showcasing her effort along with an angel made from the Usborne book) certainly got her money’s worth. 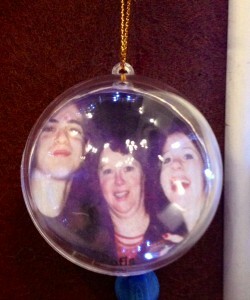 Now pride of place on the tree. My Mother-in-Law bought each of the girls Lets Colour In Kids Personalised Xmas Cards. They come as a pack of five, have each of their names on the front, and as the name suggests, they need colouring in. They are a bargain at £1.80 a pack. I’m always talking about the National Trust. They do Christmas very well. Today we went to Polesden Lacey. The house was beautifully decked out as part of its ‘A Christmas Advent’ event, which celebrates the countdown to Christmas in true Edwardian style. Awww, glad the Nutcracker is going down so well. I remember buying the cat advent calendar as well! 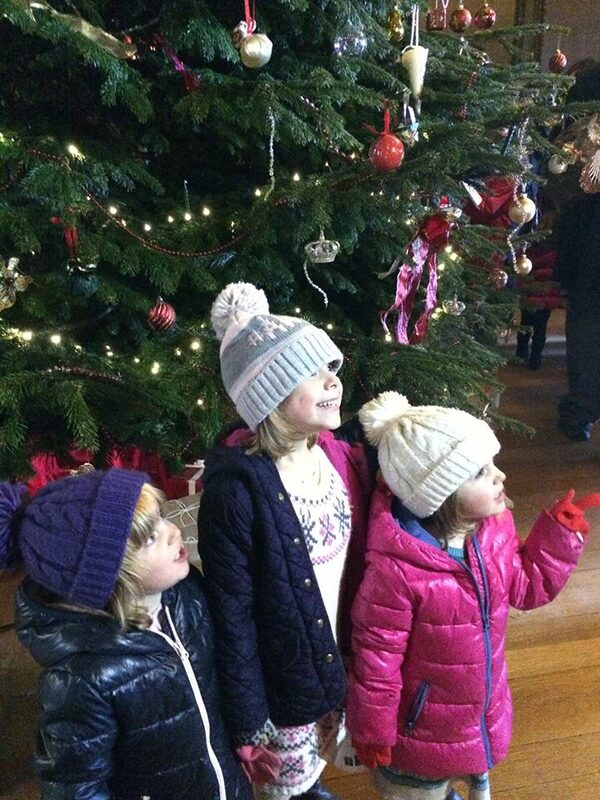 Your pics of Polesden Lacey are beautiful, it looks like the dream Christmas!